This article is about the mini-game from Yoshi's Island DS. For Yoshi's ability to throw eggs, see Egg Throw. 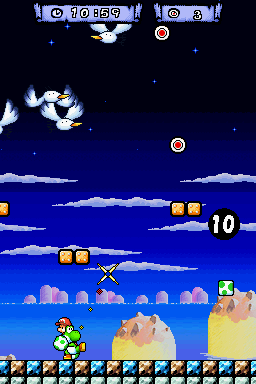 Egg Toss is an unlockable minigame in Yoshi's Island DS, where the player controls a Yoshi and must shoot eggs at targets floating above them. Many Egg Blocks nearby supply eggs. A Hard Mode of Egg Toss can be unlocked by collecting all seven Character Coins in World 5. Egg Toss made a return as the 2-player minigame in Yoshi's New Island under the name of Eggy Pop. Players have 30 seconds to hit seven targets. A few Goonies above try to interfere. Although players are given 60 seconds instead of 30 to beat this mode, there are many Piranha Plants, more Goonies, and even an undefeat-able Tap-Tap to hinder Yoshi's progress, as well as an extra two targets. This page was last edited on April 8, 2018, at 16:15.